Camping Cala Ginepro is the ideal place for all running enthusiasts on holiday in Sardinia. Running outdoors in Sardinia is a unique experience for all those with a passion for getting out there in their running shoes. 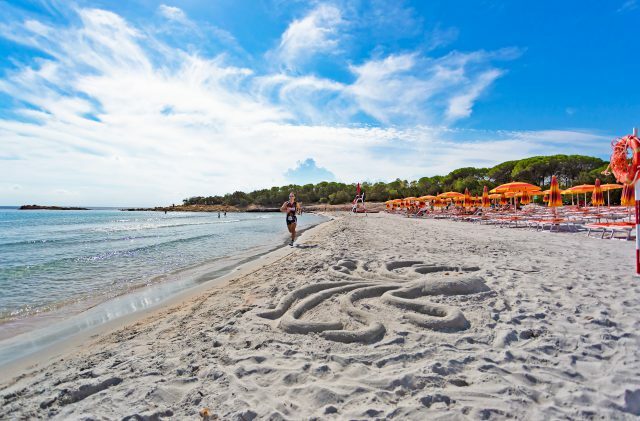 Running in the untainted natural environment of Cala Ginepro keeps you extremely fit, and you can also take advantage of all the amenities of the campsite, which are just a stone’s throw away. If you’re used to running in the city rather than in the country, you will feel the difference from the first breath you take! Your body and your skin will benefit from greater oxygenation, resulting in a whole host of bonuses both physical and psychological. There are many trails that are ideal for runners around Camping Cala Ginepro; you can choose classic road-running, if you prefer tarmac, or opt instead for trail running on various natural surfaces. You can run for miles through the pine forest or on the dirt trails, with all the benefits of absorbent terrain and air that is clean and full of oxygen thanks to the Mediterranean maquis. And then there is the singular joy of running along the shore, in your running shoes or barefoot, on the white sands of Cala Ginepro. The benefits of open-air running are innumerable. A place like Cala Ginepro seems very much to have been designed for this discipline. Why does running keep you fit? As in other sports, when you run the quantity of beta-endorphin in your blood increases. Recent studies, though, have enhanced our knowledge in this regard through the discovery that anandamide – a smaller molecule than beta-endorphin, and one that has the ability to cross the blood-brain barrier more effectively – plays an important role in the wellbeing that you feel when running. Anandamide is, therefore, more responsible, from a chemical perspective, for the “high” that we get after running. This is the scientific explanation of why running is beneficial to body and mind, with its regulatory effect on mood, promoting both happiness and euphoria! We like to think that everyone can benefit from spending time in nature. Running in Sardinia, amid the greenery of the pine trees and the fragrance of the juniper, with the breeze and the sound of the sea, against the spectacular backdrop of the first rays of the sun caressing the beach…we cannot explain all of this with a scientific theory – to understand it, you have to put your running shoes on and go…running in Sardinia! We look forward to seeing you here on your sport-filled holiday, as you run around the pristine paradise that is Cala Ginepro.